Puzzlemaster Will Shortz and Wait Wait… Don’t Tell Me! host Peter Sagal walk into a bar… No, it’s not the start of a joke. It’s the essence of Ask Me Another, a rambunctious hour that blends brainteasers and local pub trivia night with comedy and music. Host invites in-studio guests and listeners alike to stretch their noggins, tickle their funny bones, and enjoy witty banter and guitar riffs from house musician . 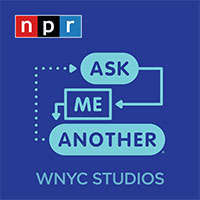 The puzzle gurus behind Ask Me Another include John Chaneski, who devised tough questions and answers for “Who Wants to Be a Millionaire” before becoming one of the “puzzle guys” on the radio program “A Way With Words”; Art Chung who has written for and produced television game shows including “Who Wants to be a Millionaire?,” “Cash Cab,” “The World Series of Pop Culture,” and “Stump the Schwab”; and actor/writer Will Hines who has performed and taught improvisational comedy at the Upright Citizens Brigade Theatre for years, and obsessively reads books on compiling baseball statistics, a task he will never have to do.